I've had the D4 for around a year now, and feel I've had enough time with it to write a reasonable review. As with most of my reviews this won't be exhaustive or a regurgitation of facts - it will deal with features that are important to me in my type of shooting. 1. Dedicated video recording button - this is not really a big deal for me. Call me old fashioned, but I found that fumbling for yet another button to start recording a video was too much for me.I simply reprogrammed the shutter button to start and stop video recording while I'm in video mode, and therefore hardly use the video button now. 2. Thumb selector for portrait - this is a HUGE ergonomic improvement! When shooting in portrait mode I used to have to reach over to the main selector button whenever I wanted to change the active focus point, but not with the D4. 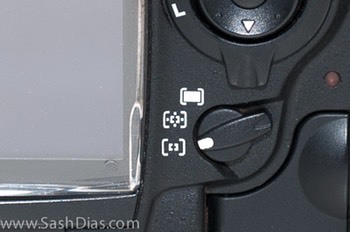 Honestly, I don't know why Nikon couldn't do this on the D3/D3X series - they had this selector button on the D300/D700 grips when they were launched. 3. New AF selector - there's a separate AF selector button just above the main selector button. Don't use this much. 4. Vertical grip 'thumb' nub - when shooting and carrying a camera for extended periods of time, your thumb's going to get a serious workout holding on to a heavy pro body. 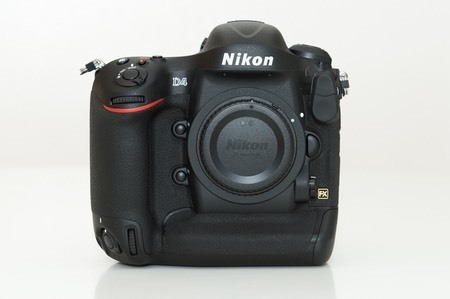 Nikon's previous generations of pro bodies had a small channel you could stick your thumb into, but the D4 has added a small rubber nub that's extremely useful when carrying the camera around using the portrait grip. 5. Placement of AF-On buttons - there are two button AF-On buttons on the body, and both have been moved on the D4. The horizontal button has been moved to the left and farther away from your thumb. Those with small hands (like me!) now have to stretch their thumbs a little more to reach the AF-On button. Not a huge deal, but annoying after a couple of hours' shooting. 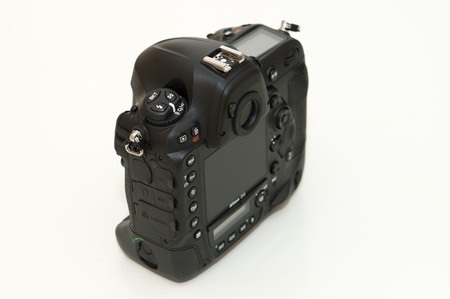 The AF-On button in vertical mode (see image above) is inconsistent compared to the position of the horizontal button - in vertical mode you need to reach across and lower, with the result that you have to consciously remember whether you're shooting portrait or landscape when you reach over for the AF-On button. Once again, not a big deal, but ergonomics are one of the primary reasons we buy these expensive bodies and for a $6,000 camera I think Nikon should have paid a little more attention. That said, it's an improvement over the D3-series bodies that had the AF button ABOVE the dial! Both these functions have now been replaced by a single button (see image below), which when used with the front and rear dials allow you to spin through the AF modes and AF area modes. In practice, it's a little easier to use after you get used to it so I'll call this an improvement. 7. Live View Selector - the D4 has a selector that you can use to switch whether the LiveView is launched for video or stills. A little more intuitive, so another small win here. 8. 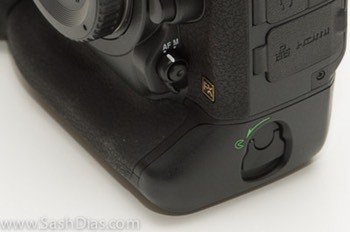 Shutter button angle - Nikon mad a big deal about this at launch, stating that the D4 and D800 had more steeply raked shutter buttons that make it more comfortable to use. To be honest, I can't really see a big difference. Overall, I think the body ergonomics have been improved in small but significant ways, and this makes the D4 easier to use on long, multi-hour shoots. 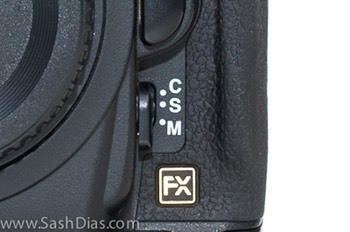 The ability to autofocus with the central 9 sensors at down to f/8 is a pretty useful feature for me. When shooting songbirds you generally need all the magnification you can get, and I occasionally even use the 600mm f/4 lens with a 2X teleconverter. In good light, AF is usable with the D4 as long as the bird isn't in brush or moving too fast. See my article here evaluating the optical performance of the Nikon 600mm f/4 VR / TC-20EIII combo. AF speed seems to be slightly better than the D3S, but strangely enough I seem to have a few more AF misses in flight photography than before. I haven't conducted a back to back scientific test (sold the D3S last year) and my strategy for flight photography has changed (moved from single AF sensor to Dynamic Area) so this is not a definitive opinion. I'll update this article as I learn more. The improved frame rate (9>10FPS) over the D3S is no big deal. The larger buffer is. The D4 has more than double the RAW buffer of the D3S, and all I can say is that I've never hit the buffer on the D4. Did manage to hit the D3S buffer a few times though. Video features are much improved over the D3S. I'm not a heavy video user, but I've started shooting a decent amount of video this year and can appreciate the improvements. The obvious improvement is the 1080p mode along with the choice of 24, 30 and 60FPS frame rates (though you can only get to 60FPS by reducing resolution to 720p). An equally important addition however is the ability to change crop mode. The D4 allows you to shoot in 1x, 1.5X and 2.7X crop modes. I use prime lenses 90% of the time, and the crop mode means that I can change the crop mode to get different perspectives of the same scene, allowing me to mix these in post processing and make the videos look more varied while maintaining consistent quality. I'd also like to comment on the audio features along with the video as that's where the audio is used. The addition of a microphone jack is important because the standard microphone picks up a lot of autofocus, electrical and general vibration and handling noises. I use a Zoom H4N recorder as a mic, and pass a heavily amped signal into the D4. More on the H4N in a separate post. Dual card slots are par for the course in the D4. The addition of the XQD slot is not a big deal to me - I just bought a large XQD card and called it a day. It seems comparable to or faster than the Lexar 1000X CF cards I use, so it's a win. The high ISO performance and dynamic range of this camera are spectacular! However, I wouldn't say it has made a giant leap in this category over the D3S - it seems to be the same per pixel ISO performance or a little better, with the added benefit of more megapixels. I'm going to make a pretty controversial statement here - I wish the D4 had more megapixels! Before you start lighting up the torches and polishing the pitchforks, let me explain why. I really don't need more than 16 megapixels in a given image most of the time, but what I do wish for are the same megapixels more densely packed into the middle of the frame whenever I shoot smaller birds (songbirds, etc.) I find myself turning to the D800 whenever the light is reasonable and I'm shooting these kind of subjects and using the in-camera crop to get that extra reach. For the D4 to be my perfect wildlife body, I guess I'm asking for a 1.2-1.3x crop factor with 16 megapixels or so. Apart from that, I'm pretty happy with the image quality of the D4 - it seems to have that perfect blend of fantastic any-light performance, good image quality and a reasonably sized raw file that doesn't try to drown my computer. You'll probably wonder why I'm devoting a whole section to this seemingly inconsequential feature, but believe me this feature has changed how I set exposure 90% of the time. In the old days (pre-D300/D700/D3) we had no auto ISO and I used Aperture Priority mode, setting the aperture to achieve the desired depth of field and then manually setting the ISO to get a shutter speed I was comfortable with. The advent of auto ISO allowed us to set the range for ISO and minimum shutter speed and let the camera decide what to set the ISO at in Aperture Priority mode, but I didn't use this feature much as the maximum ISO settings were in stops and the jumps were too high. In addition, a single minimum shutter speed wouldn't work on zoom lenses where you need a different shutter speed at 70mm compared to 200mm for example. I therefore ended up using the D300/D700/D3 generation of cameras with manual ISO. 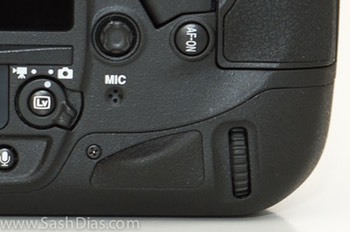 The auto ISO function in the D4 and D800 has addressed these problems, though not perfectly. Maximum ISO can now be set in thirds of a stop, which completely solves that issue. The minimum shutter speed can be set as an inverse of focal length - for example if I set it to 0 and shoot with a 200mm lens, the ISO is automatically increased until it achieves a shutter peed of 1/200th of a second. 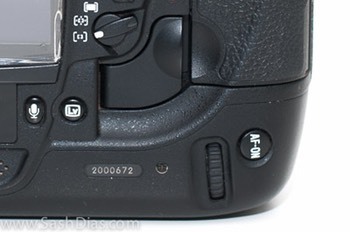 If I set it to +1 and shoot with the same lens, it raises the ISO until a shutter speed of 1/400 is achieved. So this feature now works well with zooms lenses too. However, all is not perfect yet with this feature. Let's take an example of a shooting session that includes multiple types of birds. When shooting songbirds sitting in trees, I'm comfortable going down to 1/300 with a 600mm lens and will set the minimum shutter speed at -1. Suddenly, if I see a heron coming in for a landing I need a much faster shutter speed and the auto ISO feature is buried 3 levels into the Nikon menu system. The result? A heron with blurry wings, or a missed shot as I fiddle with settings. What I'd really like is to be able to set the shutter speed just like the exposure compensation using a small dedicated dial that has a range from -2 to +2. For that, I would buy the Nikon D5! Nikon, are you listening?!! !